The DAJOERI pan flutes are high quality products which are manufactured in our workshop in Adliswil. In over 30 years of research, they have evolved from a simple pastoral instrument to a high quality classical instrument. The masterfully hand crafted DAJOERI pan flutes are played everywhere: in TV, in concerts, in schools and also at many open public events. With more than 50 albums and over 1000 single editions of sheet music makes DAJOERI publishing house the largest distributor for pan flute music. The applied music instruction method developed by Joeri Murk makes it possible to learn and master the pan flute in a short time. 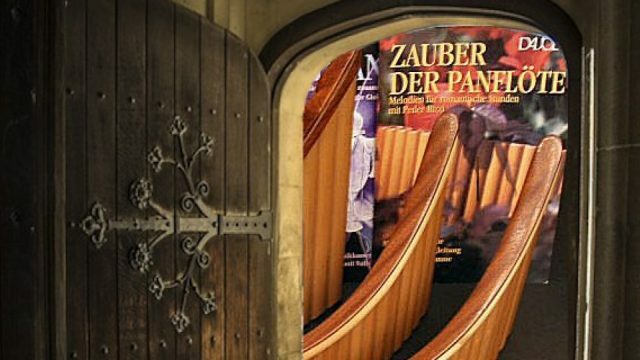 • Sunday, April 28, 2019 • The Day of the Open Door will be performed by Panevolution (Jörg Frei). Time and Location: 10h00 to 15h00. Address: Rütibohlstrasse 4, 8135 Langnau a.A. This event offers you to look behind the scene. You will discover how the high quality pan flutes will be crafted. We also will assist yu in terms of tuning and caring of the pan flute. Moreover, we also inform you about our Publishing House articles and school, such DAJOERI pan flute schools, available sheet music, CDs, DVDs and accessories. • Sunday, March 17, 2019 • The tuning workshop will be performed by Panevolution (Joerg Frei) and starts at 13h00 until 15h30. 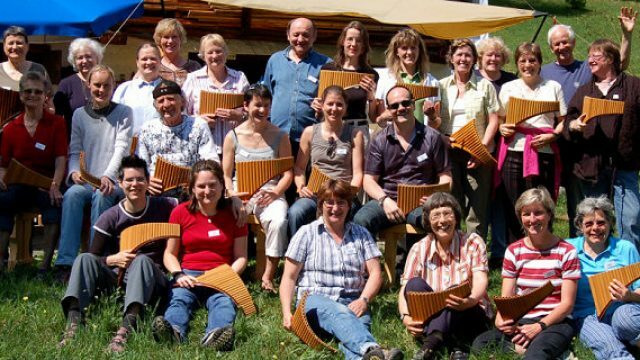 Address: Rütibohlstrasse 4, 8135 Langnau a.A., Switzerland This course will teach you how to tune your own pan flute, since temperature and humidity variations can adversely influence the pitch of your instrument. You have more fun playing when your instrument is well tuned and for playing in the group, it is a must that all instruments are properly matched in pitch. Reason enough to be able to control the tuning of your own instrument. Moreover, you will get further information regarding the care of the pan flute. • 14. – 19. 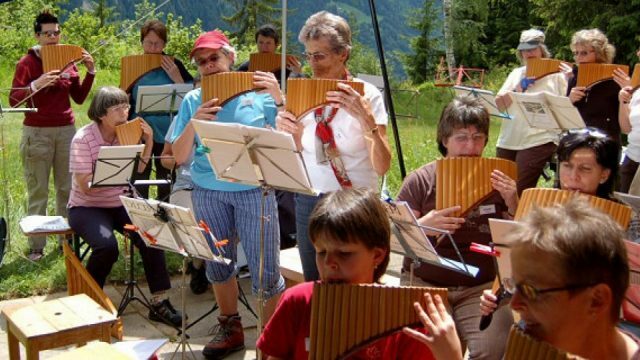 Juli 2019 • Welcome to the 28th Panflute Festival in Arosa Switzerland. For more data we will publish a information and registration document in February 2019. Stay tuned! • September 21-22, 2018 • Our seminars are becoming traditional and popular landmarks in the course of the year. Two weekend seminars (Spring and Autumn) are held on an idyllic alp site above Trun/ GR- Switzerland. It brings together young and old panflutists of various proficiency levels. They learn together, make music and relax from everyday’s life. 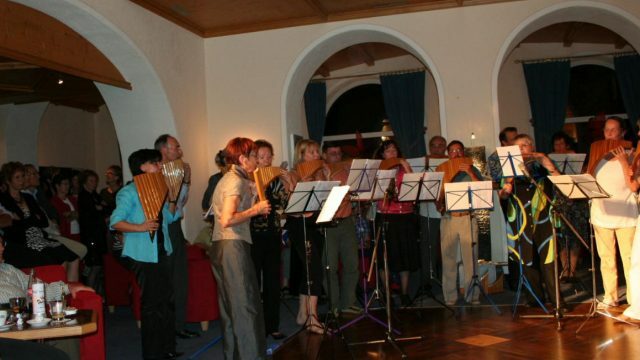 One weekend in a friendly atmosphere with a lot of pan flute playing and instructive suggestions through our teachers characterize this unique occasion.